Just a quick post today regarding writing and how much it requires of a person. I’m not sure people who don’t write — for a living or for solely creative purposes — realize just how much it takes to put words to paper and flesh out an idea. I’ve had a great week writing for and working with some very nice people. Things have been humming along nicely and I had to take a breather today and go work out other parts of my person just to get outside of my head, if you know what I mean. The physical workout seemed easier today than my mental one and it helps — to get out and get away from the computer. Otherwise, I’m here checking emails, pacing and trying to get some ideas to flow. I’ve heard comments from the people I’ve worked this week: Great job, this is exactly what I wanted! That makes it all worthwhile, but my creative writing as of late, hasn’t been up to my standards. It’s difficult for me to make the transition sometimes — from business writing to creative writing. From the last meeting with my writing group, I received lots of constructive criticism. Much of it I agreed with, some of it I didn’t. What I’ve learned from creative writing is if something rings true to you, you stay with it. Unless you’re hearing the exact same thing (criticism) over and over, then I think it’s a matter of personal choice. It’s one of those things that it doesn’t matter what anyone says, you think this is right for your character. From other writerly blogs I follow and read over the past few days, it seems as if this is a common ailment — trying to get those conversations, sights and sentiments of your character out of your head and into the flow of a story or chapter. Your brilliant mind “sees” it but it doesn’t always translate that way once you write it out. Sometimes the muse comes and sometimes it doesn’t. I’m working on a short story and I’ve written 120 pages plus of my novel, but I just haven’t had the desire to work on either lately. This too will pass. Until then, I’ll ride this wave until my rascally little muse decides to come out to play. Great! Glad you are feeling more motivated, Vikki. I’ve heard that one should (no matter if you’re feeling inspired or not) make an effort to write something every day — anything — to stay in the habit of writing. But, I think it’s like anything else, perhaps it’s best to take a day off to recharge. Thanks for your comment and stopping in. :). Thank you, kindred spirit. :). Thank you so much for your lovely comments. It’s always so nice when writerly types stop by and it means so much! 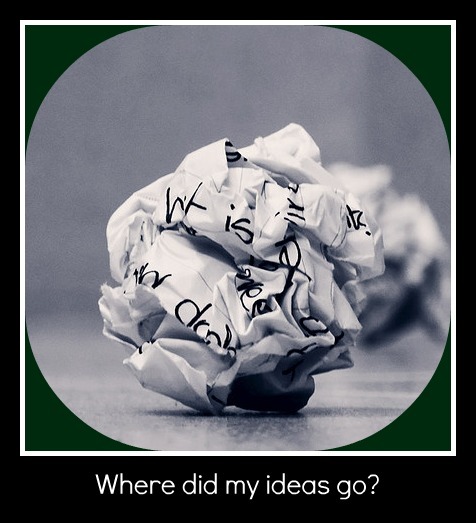 Get those ideas down on paper — you never know where they may lead. It’s difficult leaving loved ones — I’ve done it many times — but, I wish you much success on your journey! Be well, friend, safe travels and again, thanks so much for your kind, kind comments! but still not enact it. Every time I see a decent writer talk about it, it rings truer in my mind though. So, it’s helping in there. Thanks so much. For your feedback and the “decent writer” part — that’s very nice. :). The foray into the blogging world I’ve recently taken is my attempt to get back to my creative writing workout. I agree, it is tough to stay focused and motivated. Looks like you’ve done a great job over the past four months of finding engaging topics and building an audience. Writing for pleasure, or for personal expression, is much different than writing as a journalist or grant writer–which is how I spend my day jobs. I need to schedule time into each day, or at least several days a week, to be a writer. For the joy of it, for the chance to share with other writers like you, for the ability to get what is in my head out! Keep writing…we’ll keep reading. Hi there, this blogging is very different. Mine seems to be fleshing itself out as a mixture of things, which I don’t know if that’s a good thing or not. I’ve read a blog is supposed to have a focus, but I love so many things, not sure I can hone in on just one. And you are so right about writing for work — it is way different and to me, much easier than creative writing. Scheduling and forcing one’s self to write creatively — something, anything, everyday is a good practice, but one that I’ve not done in awhile! Thanks so much for your comments — they are so greatly appreciated. I’ve always loved to write. Your piece refreshes me. See if this one suits you. 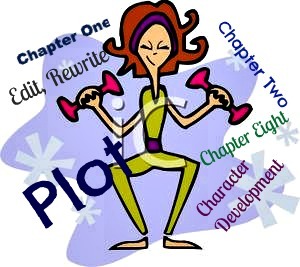 I also consider this one of my writing workouts. Hi Georgina — thank you! It’s always daunting creating a story. Will take a look soon and hopefully, others will find you here and do so as well. Good luck! Sory it took long for me to hit you back, Brigitte. Thanks, I need the luck! Regards to you! Thank you for sharing this! There are times when I dont know what to write and your post reassures me that it’s okay to experience “writer’s block.” Writing is definitely “a workout” for the brain! You’re very welcome and thank you for the comment. :). My motivation is there, but there are always so many other things competing for my time. I really need to find a better balance between online activities and creative writing. I know exactly what you mean. I’ve told myself I’ll blog 3x/week and on Thursdays, I write for me (work on my never-ending, never yet finished novel.) Thank you for stopping by as well and here’s to finishing the novel, huh? :).